Now that Delphi Developers Community is inching towards 2000 members, the component update posts are perhaps not taking over, but there certainly is a bit more activity. 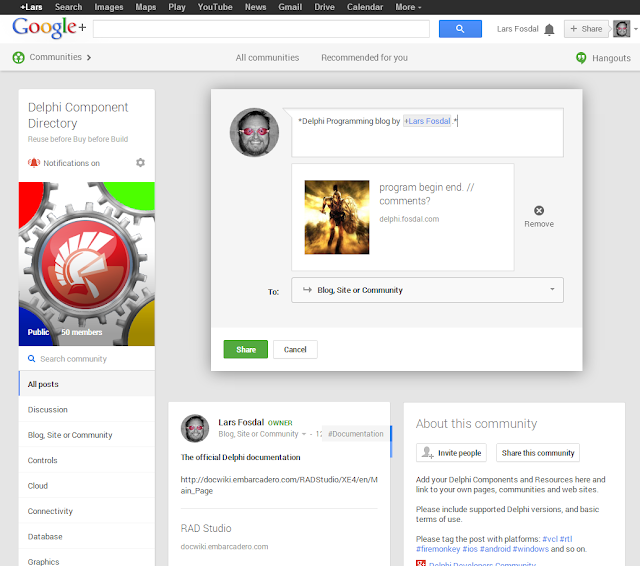 So - I decided to make another crowd sourced community for sharing components and resources. I hope my fellow Delphi developers will add posts about their components as well as web sites, blogs or communities, so that we can grow this into a useful and up-to-date Delphi Component Directory. A great way to kickstart it, is that you post a link to your favorite component or component vendor, after you have checked that it hasn't already been posted. Select the right component group, or suggest a new group, and add tags for platform (#vcl, #firemonkey, #ios, #android) or other features.